The guided-missile destroyer USS John S. McCain collided with an oil tanker near Singapore last night, leaving 5 injured and 10 sailors still missing. It’s the second US Navy ship to have a major collision with a civilian ship since June and the fourth in the past year. The collision occurred at 5:24 am local time on Monday, or 5:24pm on Sunday, New York time. The USS John S. McCain collided with the Alnic MC, a 600-foot oil tanker with a gross tonnage of 30,000, according to the US Navy. When President Trump was asked about the incident last night he replied, “that’s too bad.” He later tweeted out that his thoughts and prayers were with the US Navy sailors. The incident with the USS John S. McCain comes on the heels of a bad year for the US Navy. The USS Fitzgerald collided with the merchant vessel ACX Crystal back on June 17, 2017. The report on that collision concluded that the collision “was avoidable and both ships demonstrated poor seamanship.” Seven sailors died during that collision. On May 9, 2017 the USS Lake Champlain collided with a South Korean fishing vessel, but no one was injured in that incident. Back on August 19, 2016, just over a year ago, the USS Louisiana nuclear-powered submarine also collided with a support vessel off the coast of Washington state. There were no injuries in that incident either. The ship is named for both the father and grandfather of Senator John McCain, who issued a statement on Twitter immediately after getting word of the incident. 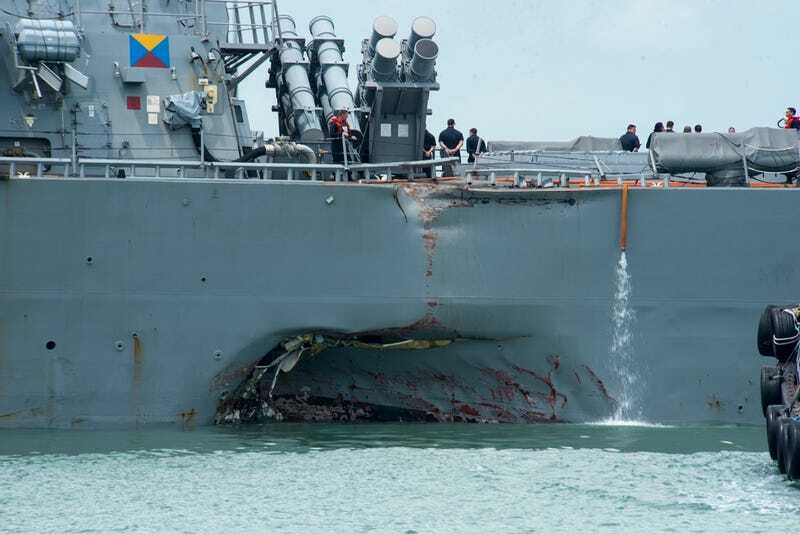 “Collisions like these are extremely rare and two in one summer, both from 7th Fleet based in Japan, is stunning,” David Larter, a US navy veteran told The Guardian. “The number of breakdowns that have to occur for something like this to happen make them a rare occurrence. Sailors monitor radars round the clock, they have multiple sailors standing watch on the bridge which also has a radar, and they have at least one lookout posted at the back end of the ship to watch for exactly these kinds of situations,” Larter continued. Both the USS Fitzgerald and the USS John S. McCain are ballistic missile defense ships, and would be crucial if activity on the Korean peninsula turned sour. With any luck, the ships won’t be needed and cooler heads will prevail. But let’s just say we’re not holding our breath. Update, 10:19am: The US Navy is now going to be looking at their entire Pacific fleet after this one. Update, 1:20pm: The US Navy has released video of the USS John McCain arriving at Changi Naval Base. Correction: This post originally stated that the USS John S. McCain was named for the Senator. It was named for his father and grandfather, both of whom were Admirals.